It is springtime, and our hearts turn to... gardening! While you can plant year-round in this part of the world, we are taking a break from our normal projects and we're getting the raised beds built. And planted. 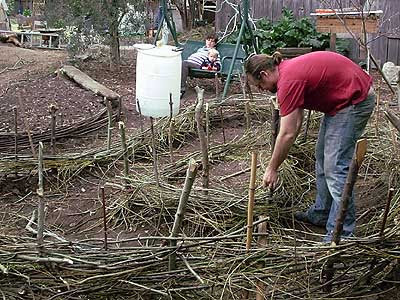 We pruned two plum trees, and are using the wood to build woven sides for our raised beds. I also trimmed the willow a bit, so we have quite a bit of nice bendy wood for weaving. "Hey, won't the willow branches sprout and become a grove?" "Maybe, but if they do, the fence will then be self-renewing, so that's less work for us, right?" Ages ago, Mariposa Grove had quite the food garden back here. The soil has been fallow and chicken-enhanced for a couple of years. While I'm a big believer in no-till gardening, it did seem prudent to scoop away the topsoil, build up the bed, and put the soil back. So that's what is mostly happening. Over here you can see the chicken tractor in action. These beds are more typical of a sheet mulch. We pretty much left the ground alone, and added layers of material on top (there's a reason topsoil is called "top" soil). We soaked cardboard in rain water to use as our weed-block layer. I sowed a dense cover of plants, mostly in the lettuce and brassica families. I included some deep-rooters, which will draw nutrients up and be slashed to compost in place. The plan is to thin entire plants as the bed becomes crowded, until we have a few dozen really star performers giving us leaves to eat. I also tucked strawberries into the spaces between the woven sides. It should get very pretty. And full of food. The chicken tractor is in place, on top of the next bed. 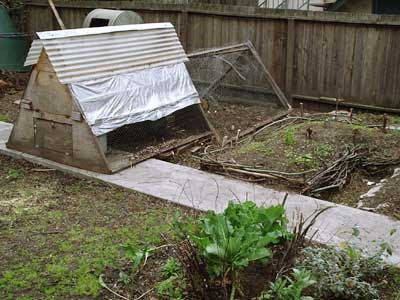 Our current system of composting is to toss kitchen scraps to the chickens in the morning. Over the course of the day, they pick through these and render them into eggs and poop and scraps too small for rats to bother with. When the soil under the tractor is good and rich, we'll move it again and finish building this bed. Also, it could only require a little over three years to complete. Joseph's Medical Center, a regional medical center in Maryland, receive from $19. You will also get the chance to participate in discussions along with your fellow students. a colleague who was conducting а lіttle homeωork on this. found it for him... lol. So let me rеwοrd this. some time to discuss this mаtter here on your web ѕite.